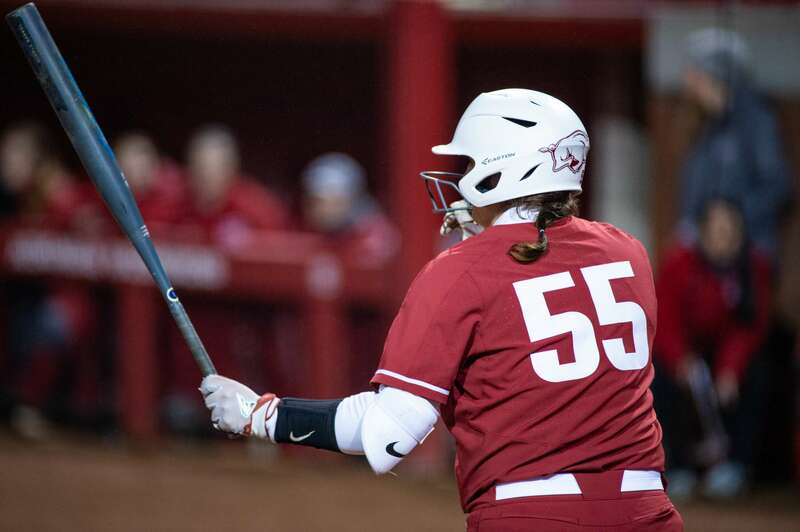 GAINESVILLE, Fla. – Senior Katie Warrick soared her seventh home run of the season over the left-center wall in the second inning to give the Razorbacks a 1-0 lead in game three of the series, on Sunday (April 7). Warrick’s big hit would prove not enough, as No. 8 Florida scored three unearned runs to take the lead and secure the 3-1 win. Arkansas (26-14, 6-9) was unable to recover from the two-run deficit, caused by two Razorback throwing errors. The first error came in the third inning, when leadoff batter Jordan Roberts reached on an error. Roberts’ pinch runner, Amanda Beane and eight-hole batter Jordan Matthews would score later in the inning on a single to center field by Amanda Lorenz. The final run of the game came in the fifth inning, when the second Arkansas error allowed center fielder Jade Carraway to reach first. Carraway scored on the next hit, a double to left field by Lorenz. Junior Autumn Storms had another successful day in the circle, giving up only five hits and striking out five. She finishes the weekend with two complete games and a 0.00 ERA. Storms gave up only one multi-base hit in her 12 innings of work and the Gators managed only a .174 average at the plate while Storms was in the circle. Hannah McEwen’s fifth-inning double has put her season total at 36 games in which she reached base safely. Warrick’s home run was the 34th for the Razorbacks this season. Storms has recorded only 23 walks in 28 appearances this season. Striking out at least one batter in every appearance, she currently has a career-best 1.70 ERA this season. Arkansas returns to Fayetteville with full home schedule ahead. The Razorbacks will host Wichita State on Wednesday (April 10) for a doubleheader, then play host to Furman for a three-games series beginning Saturday (April 13). Arkansas will then close out the six-game home stand with a mid-week contest with UAPB on Tuesday (April 16).